In 1924, George Mallory’s attempt to summit Mount Everest, in the Himalayas, ended in tragedy. However another man (Percival Bromley) disappeared that day on the mountain. Now, one year later, three climbers; Richard Davis Deacon, Jena Claude Clarioux, and Jack Perry have journeyed to Tibet. They claim they are searching for the missing Percival Bromley, but have actually come to Everest to summit it themselves. Their journey will be a struggle against the wild mountains, rival climbers, and the mysterious snow demons known as the Yeti. 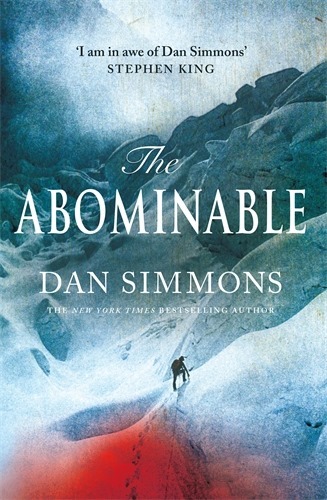 Dan Simmons has written a number of books that combine real historical events with fictional elements such as Drood (about the real reason Charles Dickens last novel was left unfinished), and The Terror (about what really happened to Sir John Franklin’s 1840 expedition to find the Northwest Passage). This book talks in great detail about the tactics and equipment used for mountain climbing in the 1920s, and does an excellent job of capturing the sense of a world recovering from the ghastly scars of the First World War, but realizing it is sliding towards an even greater tragedy. Progressing from the Matterhorn in Europe, through the stately manors of London, the highlands of India, and the wilds of Tibet, this book tells an exciting tale of adventure against the unknown. That being said, this is a long book, and highly detailed covering a range of topics varying from Tibetan funerary practices to the landscapes of Capability Brown. Simmons has chosen to frame the book as the first person diary of Jack Perry, so there are long asides, and points were the reader is lead to question the narrator’s reliability. It can be tough to read at time for it replicates the archaic style of writing common in the 1920s. However it moves quickly, and features a second act twist that is quite surprising. The third act relies on some rather stretched coincidences, but the events make sense for the world established in the book. I would recommend this book to anyone interested in the Himalayas, the 1920s, or mountain climbing, and anyone who likes adventure with elements of psychological horror. Dan Simmons’ 2007 novel The Terror, focuses on another group of men facing the icy wilds, this time in the Arctic. Based on the real life disappearance of Sir John Franklin’s 1845-1848 Northwest Passage Expedition it offers a possible solution to this historical mystery. If you are more interested on exploring under the Earth, instead of climbing above it take a look at Jeff Long’s The Descent (1999), which focuses on a group of cavers that make a discovery of grave consequence for the world*. *This novel is not related to the British 2005 film The Descent, or its 2007 American remake which are also about caving and encounters with strange creatures.